August 31, 2015 bcalvanocoaching1 Comment on Weekly Angel Oracle Card Reading for August 31st through September 6th. Weekly Angel Oracle Card Reading for August 31st through September 6th. http://www.blogtalkradio.com/letsasktheangels/2015/08/29/what-is-angel-therapy-healing Subscribe with your email to receive the latest updates of my radio shows and my free weekly angel card readings. Both are provided to support you the utmost in living your life with grace and ease! For the beginning of the week we have a message from Archangel Michael, “ Patience”. Many of us may have been rushing or anxious to make things happens or manifest. The message here is to “allow” things to happen in our lives. We take the appropriate actions and then we let go and allow God and the angels to work for us. This is a reminder to connect to our inner stillness and peace. We have most likely set many ideas and projects into motions by this time of the year. We can easily get frustrated and stressed if things are not happening fast enough. Know that Divine wisdom is in charge and that everything is happening at the right pace and time. 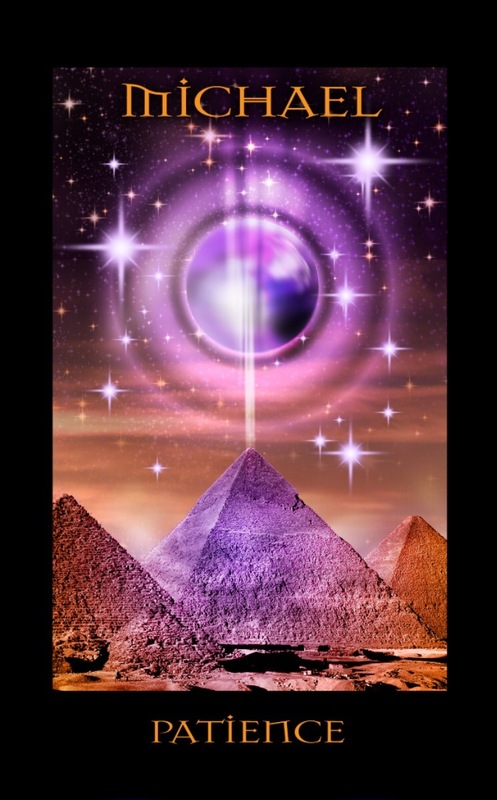 Even the 3 pyramids as depicted on the card were once a project that took many years to complete and now has been standing for over 4,500 years. See patience as an active force in divine manifestation. Breathe deeply as you say the word to yourself, patience. Allow yourself today to experience a deeper level of patience, love and connection with yourself and with God, your higher power and source. 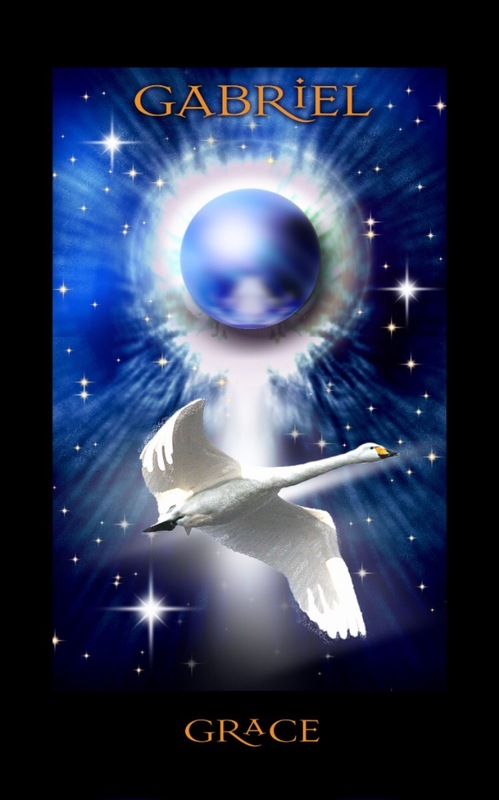 For the middle of the week we have a message from Archangel Gabriel, “Grace”. Here we are reminded that we are so loved by God and the angels, that we are born of spirit and divine love, that we are grace. We are asked to remember that all things will work out with elegance and ease. We see the swan unfolding its wings and taking flight. From stillness in the water it moves into the air naturally, effortlessly and majestically. Remember that you are born of and filled with grace. Gabriel brings us this message to remind us if we may have forgotten often getting caught up in struggle and fear. Trust and have faith that there is a bigger picture and a divine plan in action. When you recognize that your soul is a gift of grace you can connect again to your magnificence. By chanting OM three times you can connect to the experience of grace flowing through your body. For the end of the week and weekend we have a message from Archangel Raphael, “Empathy”. Raphael, the angel of health and relationships, asks us to examine our empathy towards others thereby bringing healing to ourselves. The definition of empathy is the capacity to understand or feel what another person is experiencing from within the other person’s frame of reference, or in simpler terms to be able to stand in another’s shoes. 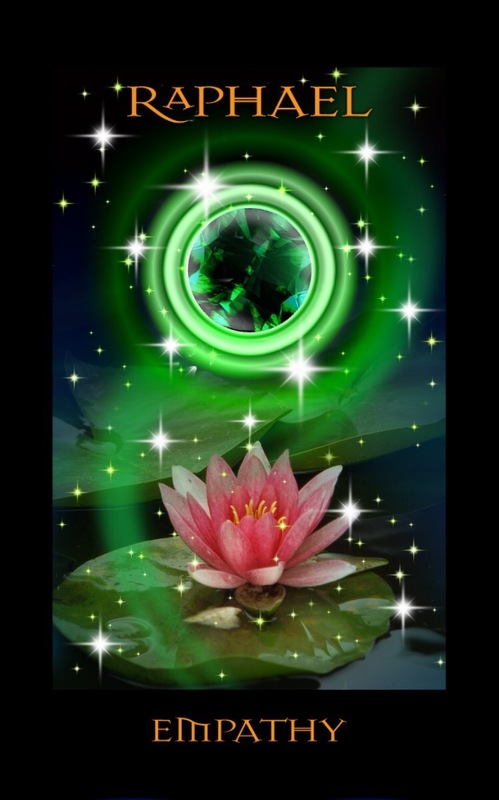 The lotus is the symbol of enlightenment. You can awaken or reconnect to your own enlightenment by allowing more empathy in your life. The beauty and stillness of the lotus flower is who we and others really are. We are all in this world together each day doing the best we can. To bring harmony and even more health in our lives focus on being more empathetic or compassionate. This week we have the Archangels Michael, Gabriel and Raphael supporting us with the messages of seeing patience as an active form of manifestation, seeing who we are as an embodiment of God’s grace and knowing that empathy can open doors to enlightenment. It’s a week of powerful introspection and self awareness. For a personal in depth angel card reading and life coaching on how to effectively work with your angels to create a life you love, contact me at bcalvano-coaching@usa.net to set up an appointment. I have a one hour special price I am offering at this time. Bcalvanocoaching offers special programs of ongoing coaching sessions. Spiritual intuitive guidance, angel messages, energy clearing and life coaching all to create the results in all areas of your life. I also provide group angel readings. Sometimes I feel that your message from the Angels is talking directly to me. And I say to myself, “ out of the billions of people in the world, how do they know that this is going on in my life?”; Because it is? Next Weekly Angel Oracle Card Reading for September 7th through 13th.